Boss and JHS Pedals have combined forces in order to celebrate the Boss compact pedals 40th anniversary. Housed in the unmistakable Boss compact design, these two giants of effects have created an overdrive pedal that cannot be matched in versatility. The eye-popping design of the Boss JB-2 looks just as individual as the sound that it can create. The Boss JB-2 may be white and red in colour but boy can it help you play incredible blues. Thanks to the addition of independent level, tone and drive knobs as well as a 6-way mode selection including parallel and series circuitry, you'll have thick and unique overdrive tones in no time. 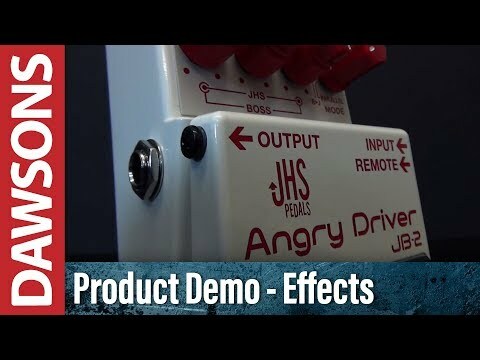 Like all compact Boss pedals the JB-2 Angry Driver was built to last. With its thick metal housing and rubber pressure pad, you can be guaranteed years of use without wear and tear. An optional remote input also means you can trigger the JB-2 via an optional pedal of your choice. Boss and JHS are giants in the guitar pedal industry in their own right so when they come together you can expect something special - the Boss JB-2 Angry Driver Overdrive Guitar Effects Pedal.